Whether it’s gay cruising, Mardi Gras or Halloween, Joshua Heath explains how he’s created some awesome party outfits with glitter, a glue gun and imagination. USUALLY, creating my costumes begins months in advance, sourcing fabrics, crystals and jewellery. Then I start building them on a mannequin, a process that can take a month or more. 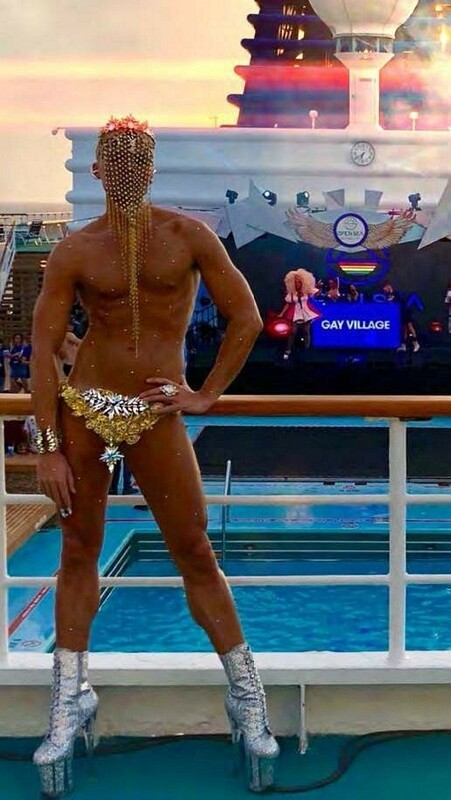 But last year I received an invitation to join the inaugural Open Seas gay cruise out of Barcelona as an on-board host just 12 days before the ship sailed! And they wanted seven different looks, one for each of the themed parties (Dress To Impress, Fetish, Eurovision, Back To The ‘90s, Gala Dinner, White Night and Extravaganza) and each one bigger and better than the last. At first I was overjoyed; it was exactly the kind of gig my creative soul dreamed of. Then, fear and complete panic! How was I going to pull off this huge costuming feat? There wasn’t enough time to make everything myself, so I called on some amazingly talented friends to pitch in.